We all know that a walking experience is exceptional but, some walks are more than that, beyond exceptional, unreal, mind blowing. I can hardly find a word to describe it. I have had some incredible encounters since my last blog, unforgettable memories. I walked into a pride of six lions robbing a leopard kill in a tree. Hippos walking a few meters from us with only a rock between us and these two barrel shaped monsters. Herds of buffalo approximately 200 strong. Elephants are a daily encounter, breeding herds with cute little ones to the giant bulls in must. I personally thought it could never get better until two days ago. A morning walk with the Letts family. 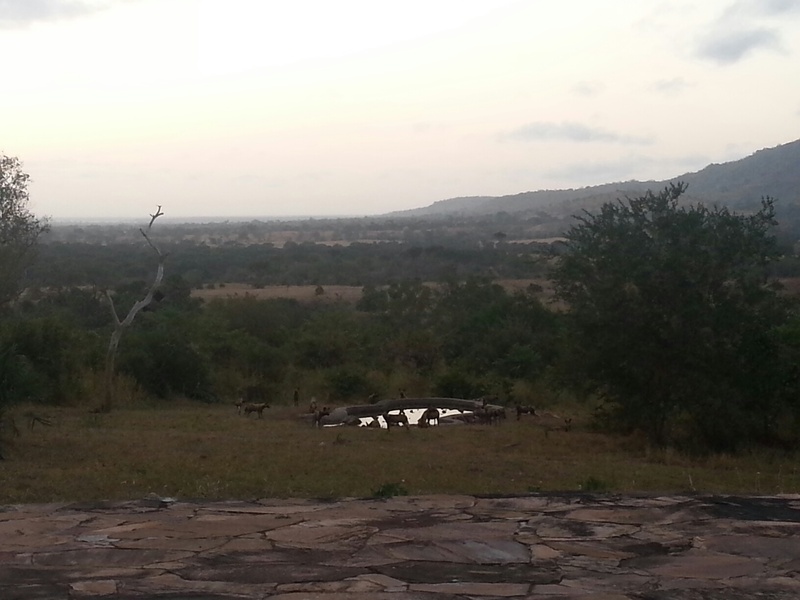 We started off with a pack of 18 wild dogs at the water hole in front of the main area, this was before I could do my briefing. They had a drink and ran off to the Msine valley, thinking that’s the best a day could offer we started our walk. We took the same path the dogs took and as we got to the Msine valley, whilst looking at the tracks an impala came full speed towards us, followed seconds later by a dog, this impala survived. Whilst digesting what we just saw, another impala came running, this time the whole pack chasing, as they ran past us from all directions they barked at us making sure we understood they knew we were there but were determined to find breakfast. It was my first time to see wild dogs in a chase on foot. On we went and found some Rhino middens and buffalo tracks that led us to two dagga boys. All was great, so far and couldn’t ask for more, after breakfast I thought we would walk into the palm forest, and before crossing the Msine river, a leopard flew from a sausage tree, I had never seen a leopard on foot let alone one flying. I say this because this leopard did not bother climbing down the tree she jumped from more than 5 meters, most of how we saw it was in mid-air. As we ventured further into the forest, first baboons then elephants picking up palm fruits, the wind was not in our favour and they got a little nervous so we left them in peace. After this encounter we discussed what we had seen and we all agreed, it could not get better than it already was, so far we had seen 3 of the big five in the flesh and signs/tacks of 1, complementing that with the dogs it was as though we had seen it all. Lions were the only ones missing in this unbelievable walk, not with much hope we started walking back to camp and what do u know, we scared a pride of 4 lions off a shady bush they were resting under, they quickly moved into think vegetation and we headed back to camp. 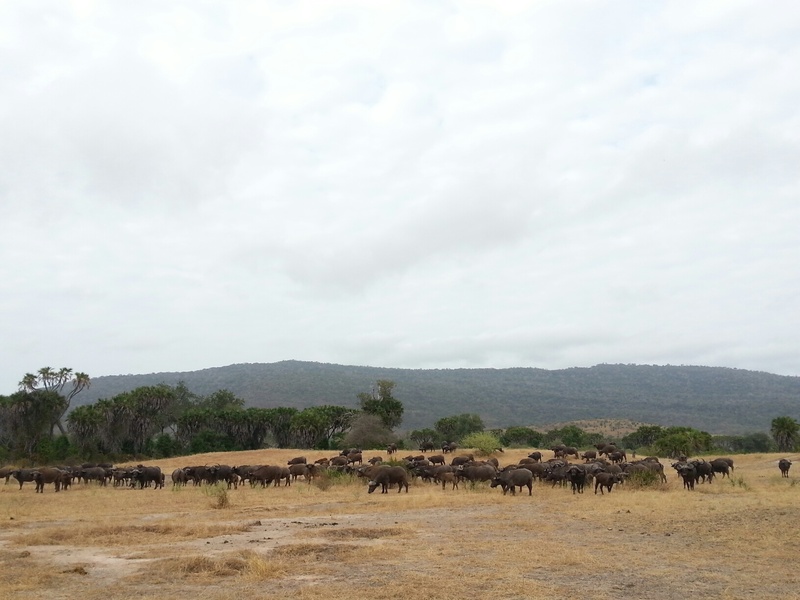 As all this was happening, hyena, impala, zebra, wildebeest and warthog were not left behind. I have been on many walks but this day is going to take a long time to beat if ever, wild dogs, leopard, lions, buffalo, elephants and rhino tracks all in four and a half hours. Best walk in my life. 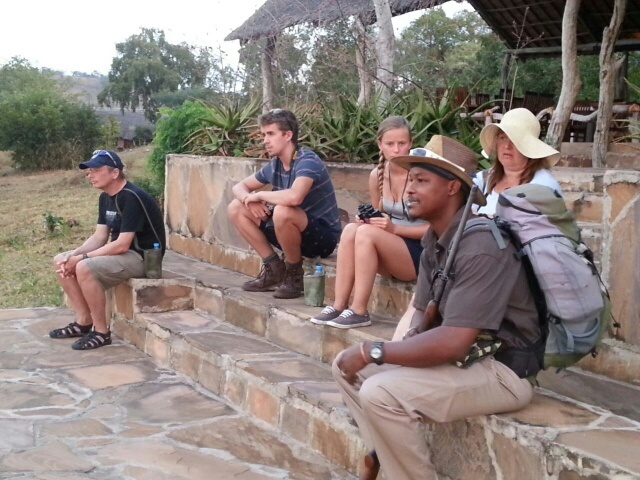 This entry was posted in Heribert, Wildlife and tagged Beho Beho, Bush Walk, camp, Heribert, Hippo, leopard, lions, safari, selous, wild dogs. Bookmark the permalink.